The Auto Marketing Blog: Is Smart the Right Product at the Right Time? It was just announced today that the new Smart car fortwo surpassed the 15,000 units they expected to sale and not by an insignificant margin in a down market. They sold 25,000 units overall and had 100,000 people send in their $99 checks to reserve a Smart car in 2008. The reservation approach was part of Smart’s marketing push to get people to pre-order a vehicle prior to the car’s launch in the United States. Smart did no TV and went with an online campaign approach, similar to what Mini did back when it launched its brand in the States. Apparently, if you are a stylish, European, small car you will launch with an online campaign and avoid the expense of TV since word of mouth is bound to drive your sales. 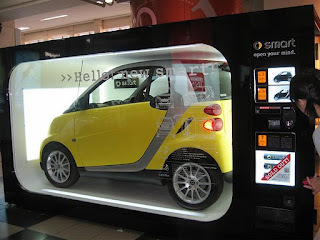 Smart is constantly hailed as a car for the consumer looking for high mpg economy in a world of unstable gas prices. But a lot of cars are being offered for this new shift to fuel economy conscience customers. Toyota has the Yaris. Honda has the Fit. The Yaris and Fit are not attractive cars. They are pure economical choices for a cost driven customer. Meanwhile, Smart and Mini offer high mileage choices but with the added benefit of being stylish and iconic. After finishing a tumultuous 2008 in automotive sales and crazy up and downs at the fuel pump, it is interesting to see how a car is correlate to the gas pump. 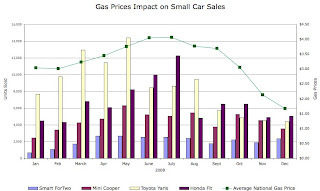 The Honda Fit and Toyota Yaris are definitely following the behavior of bouncing gas prices while the Smart and Mini keep a relatively steady, almost predictable, sales stream. 1.) Is stylish and fuel-efficient the perfect combination in today’s market? 2.) Do Mini and Smart simply sell a consistent number of vehicles because they limit supply so much that we do not see the sales swings found in higher production unit vehicles?